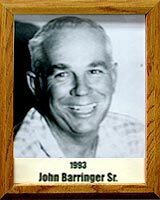 When Santa Rita Park Pool opened in the summer of 1929, John Barringer was there for the springboard diving exhibition. A 1931 graduate of Tucson High, who also attended the University of Arizona, Arizona State University, and the University of Hawaii, John, has been an inspiration to young swimmers for many decades. He coached and worked with swimming and diving teams for the City Recreation Department, YMCA, Oury and Himmel Parks, Arizona Inn (synchronized team), Tucson Country Club and UA Men’s team. John officiated hundred of swimming meets, served for many years on YMCA Aquatics & Physical Education Committees, conducted holiday and special event days for City Recreation, was Director of Health, PE & Recreation for Tucson Unified School District (helping develop Little League softball and Special Olympics), helped organize the Tucson Aquatic Officials, which later became other such groups. John did occasionally operate on dry land. From 1939 to 1942, he worked with the Star Cowboys in the City recreation youth baseball program, along with Babe Hall, George Genung, Billy Mann, Fred Enke and others. From 1939 to 1942, he coached baseball, basketball, track, and flag football at Wakefield Jr. High. A three-time president of the National Council of City/County Directors of Physical Education, John is a recipient of the Channing Mann Award.